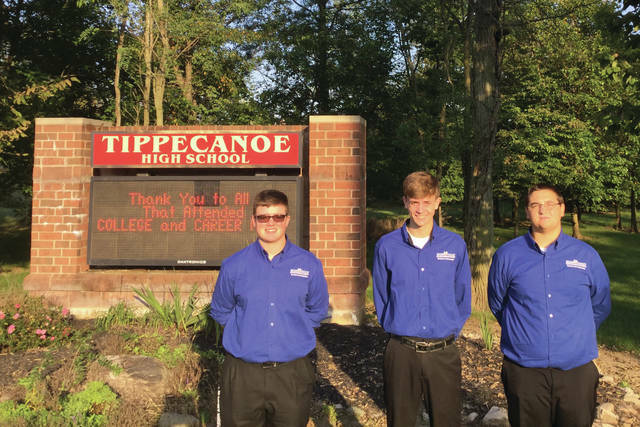 Provided photo The Miami Valley Career Technology Center (MVCTC) Student Ambassadors visited Tippecanoe High School on Oct. 8, including Carter Ward (Graphic Commercial Arts/Ansonia), Noah Law (Auto Collision/Tipp City), and Chace Trent (Agriculture and Livestock Production/Tipp City). TIPP CITY — The Miami Valley Career Technology Center (MVCTC) Student Ambassadors visited Tippecanoe High School on Oct. 8. Students Ambassador’s representing MVCTC included Carter Ward (Graphic Commercial Arts, Ansonia), Noah Law (Auto Collision, Tipp City), and Chace Trent (Agriculture and Livestock Production, Tipp City). Ambassadors shared career technical training programs and college opportunities. MVCTC offers 40 career technical programs for high school juniors and seniors. MVCTC continues to prepare students for college and careers after high school. Over 85 percent of students earn college scholarships and over 93 percent of students employed, in an apprenticeship, in the military, or enrolled in college six months after graduating. All sophomores from MVCTC’s 27 partner school districts have the opportunity to select two career programs to visit at MVCTC during the annual Sophomore Career Days. This year, Sophomore Career Days are scheduled Nov. 27-29. The annual MVCTC sophomore open house scheduled for Thursday, Nov. 29, from 4:30-7 p.m.
For more information about Sophomore Career Days or visiting MVCTC, please call (937) 854-8056.
https://www.weeklyrecordherald.com/wp-content/uploads/sites/51/2018/10/web1_Tipp.jpgProvided photo The Miami Valley Career Technology Center (MVCTC) Student Ambassadors visited Tippecanoe High School on Oct. 8, including Carter Ward (Graphic Commercial Arts/Ansonia), Noah Law (Auto Collision/Tipp City), and Chace Trent (Agriculture and Livestock Production/Tipp City).